The sitcom ALF certainly goes down in TV show history as the most unique sitcom of the 1980s. The sitcom centers around a furry alien by the name of Gordon Shumway. He’s nicknamed ALF (Alien Life Form) after he crash lands into the Tanner family’s garage. The family is unsure what to do but ultimately decides to hide ALF so that he won’t fall into the hands of the military’s scary Alien Task Force. In many ways, they come to regret their decision as the short extraterrestrial is crass, wants to eat their cat, and usually causes expensive disasters. In the show’s second season, ALF becomes obsessed with Gilligan’s Island and dreams that he becomes a castaway. In the dream sequence, he meets Gilligan (Bob Denver), the Skipper (Alan Hale, Jr.), Mary Ann (Dawn Wells), and the Professor (Russell Johnson). Though their island life looks ideal on-screen, the castaways have been shipwrecked so long that they’re sick to death of all the things that ALF fantasizes about. Yes! Do a new series! Sure, in a TV special. Short clips on the web. The absence of the other three island inhabitants, the Howells and Ginger, is explained by a line of dialogue that has been cut from the syndicated version of the episode. 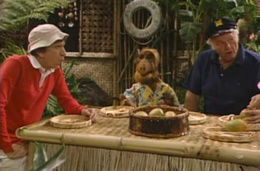 ALF is told that they formed a country club on the other side of the island and won’t let the rest of the castaways be members. In reality, “Movie Star” Tina Louise had long ago distanced herself from Gilligan’s Island. Jim Backus (Mr. Howell) was very ill and had stopped performing. Natalie Schafer (Mrs. Howell) was quite old and had virtually retired.